Your Cosmetic Dentist in State College Says You Need a Smile Makeover! Are you unhappy with your smile? If so, then it can have a negative effect on your confidence and the impact you have on other people. That’s because most people will notice the condition of your teeth before anything else. Thankfully, your cosmetic dentist in State College can rejuvenate your smile with porcelain veneers and lumineers. Read on to learn how! Porcelain veneers are wafer-thin ceramic shells that are custom-designed to fit directly over the teeth in the smile zone. It can mask slight imperfections like gaps, crookedness, crowding, misalignment or stains. First, a thin layer of enamel is removed to allow the veneers to fit into your smile line properly. Next, bite impressions are captured that are sent to an in-network lab. While waiting on your permanent veneers to be fabricated, you’ll be fitted with a temporary set to protect your digits. When the permanent veneers are ready, you’ll return to your cosmetic dentist to be fitted, and any needed adjustments will be made as well, leaving you with the smile of your dreams! If you’d like to enhance your smile in a non-invasive way, lumineers may be perfect for you. They are similar to porcelain veneers in that they are crafted from high-grade ceramics that provide a way to mask smile flaws. However, the lumineer method doesn’t require any enamel removal because the shells are thinner than porcelain veneers. Because lumineers don’t require any structural changes and fit right over your teeth, the process can be completed in just one visit, leaving you with a beautifully remade smile. Owning the Camera for the Holidays! 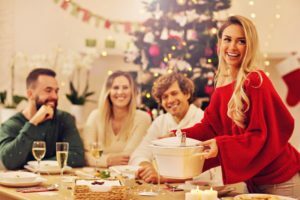 Over the holiday season, there will be several opportunities to pose for pictures, whether it’s during the company potluck, at a family gathering or while hanging out with friends. If your teeth don’t look the way you’d like, it can be stressful and can even lead to depression. With either lumineers or porcelain veneers in State College, though, you won’t have to worry about taking unflattering photos or feeling insecure when meeting new people. Instead, you’ll be eager to stand before the camera with the biggest smile possible and share your infectious personality with others. The process starts with reaching out to schedule a consultation with your cosmetic dentist. While there, the expert will listen to your concerns and help you determine the best treatment option so you can experience smile perfection! For over two decades, Dr. Kevin Labosky has been providing comprehensive and compassionate care. The Temple University School of Dentistry graduate combines his years of expertise with the latest dental equipment to help patients achieve their dream smile. Dr. Labosky boosts patients’ confidence by correcting unwanted flaws with porcelain veneers and lumineers at his private practice, and he can be reached for more information through his website. Comments Off on Your Cosmetic Dentist in State College Says You Need a Smile Makeover!